Sitting at my desk at work on Thursday morning I was distraught looking at the fantastic weather forecast for the weekend and realizing I had no plan. I sent an e-mail to Jeff Valliere asking him what his plans for the weekend and got a reply saying he was going to do something in the Front Range but that John Prater had a couple of ideas but was looking for some company. 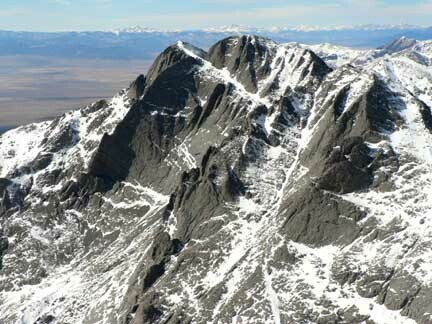 I sent John an e-mail and received a reply that he was thinking about climbing Crestone Needle. That sounded interesting and was close to home for me so I replied that I was interested. His next message mentioned he'd like to consider the traverse to Crestone Peak and that sounded very interesting. The plan was set! I mentioned the plan to Bill and he was in as well. Bill and I left Los Alamos around 5:30pm headed to Cottonwood Creek TH on the west side of the Sangres where we planned to meet up with John who was driving down from Superior that evening. We pulled up at the trailhead area around 8:45pm where John was waiting having arrived about 20 minutes before us. We chatted in his Sportsmobile for bit and went over details on what gear we'd be bringing up the next day. Snowshoes? Nah. Ice tools? No, just an ax each. Ice screws? Three. Rope? 60m, 8.5mm. Harness? Yep. Rack? A few nuts, a few cams. Webbing? 20 feet or so and some rap rings. Helmet? Yes, unless it was left at home like mine was! D'oh! John offered us sleeping space in the Sportsmobile and we hit the sack around 10:00pm with an alarm set for 3:30am. If we were going to manage the traverse we'd need all the daylight we could get and getting a lot of the approach done in the dark would be helpful. The alarm didn't fail us and went off as scheduled at 3:30am. We boiled a couple pots of water, put on our clothes and started hiking at 4:30am just as planned. It was a suprisingly warm morning at about 20 degrees. Extremely warm for the San Luis Valley in February! By the light of our headlamps we followed good tracks through the intermittent snow and dry trail for the first half mile or so before the trail was mostly snow-covered. Thankfully the tracks in the snow continued making route-finding a non-issue and allowing us to move quickly. We covered the first 1,600 feet in a little over an hour and were soon at a point where the tracks stayed low but we wanted to stay high. John had been up this way in January 2004 with Dan Mottinger to climb Crestone Peak and they had stayed high on the north side of the drainage with good success. We decided to go with that route again and left the comfort of the previous tracks through the snow and headed to our left up through the snow and trees to drier ground. We exited the trees around 10,300 feet just below a nicely frozen waterfall and scrambled up some rocky slabs (not the "boiler plate" slabs)on our way higher on the north side of the drainage. 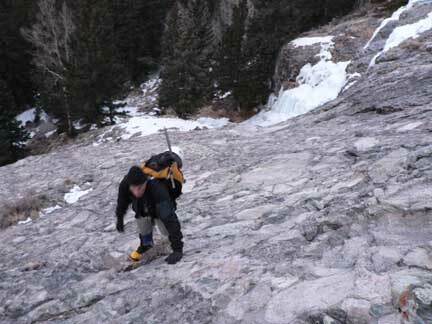 Bill scrambling on the slabs around 10,300 feet on the north side of Cottonwood Creek. John did an excellent job of routefinding above the slabs, across a scree/talus field and intersecting back with the standard trail around 11,600 at the top of treeline heading up into the Cottonwood Lake basin. From here we could now see Crestone Needle starting to warm up in the early morning light. The cameras came out and we took numerous photos and marvelled at how dry it was. I was expecting things to be farily dry but was amazed at how dry it appeared to be. It was also a beautiful day with no clouds to be seen and was only 7:30am so I was getting excited at the prospect of being able to do the traverse from the Needle to the Peak! 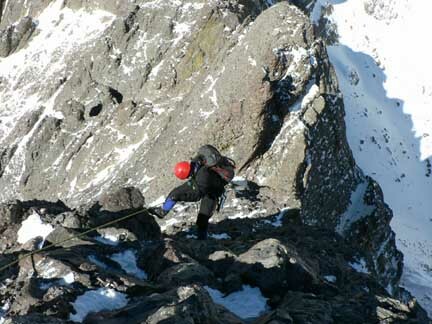 But now we had to decide how we wanted to gain the south face of Crestone Needle without too much postholing. After some discussion we headed east across the creek and started making our way from rock island to rock island heading for the drier slabs of rock above and south of Cottowood Lake. The going was mostly nice with minimal postholing but I did manage to poke through real good once and smacked my left knee on a large, stationary boulder. It hurt but after recuperating for about a minute I was ready to go again. Around 8:15am we entered the sun's rays for the first time that day and took a moment to warm up a bit and snack. We found ourselves on a small bench about 80 feet above Cottonwood Lake and knew we'd have to descend towards the lake before ascending again towards Broken Hand Pass and the South Face route up Crestone Needle. 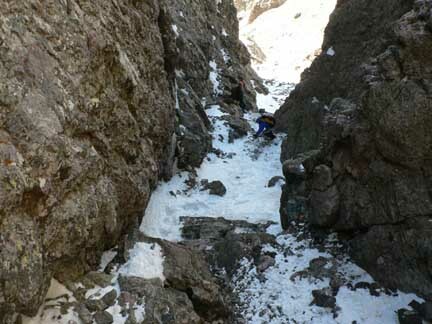 John nicely managed a route through some hard, icy snow and rocks down into the basin. The day was warming up so we shed some layers and began our way up Broken Hand Pass but opted to stay a bit to the left and head more directly up the Needle which saved us a bit of distance. The lower gully was snow-filled and Bill kicked some great steps up this lower gully to intersect the mail trail from Broken Hand Pass towards the bottom of the main couloir up the Needle's south face. 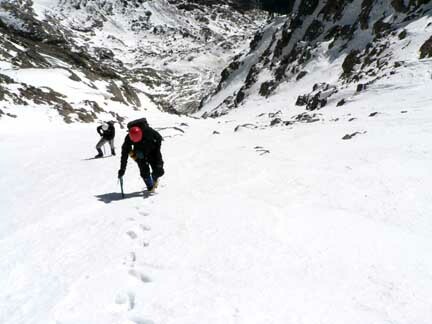 Around 9:50am we reached the bottom of the eastern couloir up the face at 13,300' and started up. The center of the couloir was filled with snow but it was easier and more efficient to stay on the dry rock on the right side of the couloir. When we noticed the cairns marking the crossover into the western couloir we scrambled across the snow and over into the western couloir. The scrambling was very enjoyable and I was having a great time. Every now and then some icy or snowy rock would keep things interesting but overall the climbing was good and smooth. As we got higher the amount of snow increased but it certainly wasn't as much as I would have expected for February. Around 10:30am we crossed back over into the eastern couloir and kept moving up but stayed a bit more left than I have previously. The scrambling on this side was a bit steeper and fun. John and Bill climbing up the top of the eastern couloir a couple hundred feet below the summit of Crestone Needle. I reached the top of a small ridge just south of the summit and had a great view down the south face while John and Bill were working their way up. Looking down the south face of the Needle from just below the summit. The guys finished up and we stood on the summit just a few minutes after 11:00am. The day was still perfect! A slight breeze cooled us down as we ate a snack and flipped through the register. It appeared we were the first group on the Crestone Needle since October 15th, 2005, and that person was from Los Alamos as well. We looked across the ridge to Crestone Peak and discussed our options. It was still relatively early, conditions were good and we all seemed to be feeling good. If conditions on the traverse were tough we could bail out and down towards Cottonwood Lake via a large couloir we studied on the way in. The traverse was on! We strapped on our harnesses and headed over to the rappel station that marks the start of the traverse. Two good looking pieces of webbing and two rap rings were in place and we liked what we saw. John rappelled first at 11:45am. I had neglected to bring the harness with my rappel device so I went second so that Bill could check my Munter Hitch before I committed to the Munter rappel. Bill rapped last. John rappelling the initial 100 feet off the Needle to start the traverse. At the bottom of the rappel we had a good look at conditions and it looked pretty darn good. John opted to put his crampons on while Bill and I decided to leave ours on our packs. John had done the traverse in the past and I had done it once each way in years previous so we hoped the route-finding would go smoothly. John took the lead and the fun began! The downclimbing was good and mostly dry. Following the path of least resistance, sparse cairns, worn rock and John, we quickly found ourselves at what I consider the crux of the traverse--the loose gully between the southern gendarme and the central gendarme. At the top of this gully one has an exposed view down both sides of the traverse and it's one hell of a long way down on the northeast side! The gully was filled with snow and ice so we stuck to the sides using good holds on the rock walls and placing our feet carefully. 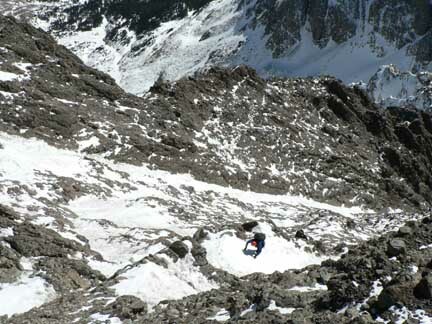 Descending the cold, loose gully between the southern and central gendarmes on the traverse. 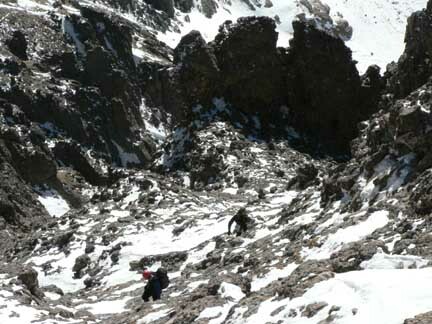 A short bit of steep downclimbing at the bottom of the gully lead to easier ground and our pace picked up a bit as we traversed on intermittent rock and snow towards the bottom of the main couloir on Crestone Peak's south face around 13,500'. The snow in the couloir was wonderful! It made for great step kicking and efficient upward travel. In fact, it felt like a good spring snowpack but it was February! We started up kicking steps at at a slow but steady pace. By this time we were really starting to feel the effects of the long day we had had thus far and progress was slowing. Ah yes! Beautiful snow climbing on the south face of Crestone Peak. From below the snow climbing looked to be fairly short but I had forgotten we were now ascending the eighth highest 14er in Colorado and would have to climb to nearly 14,300'! 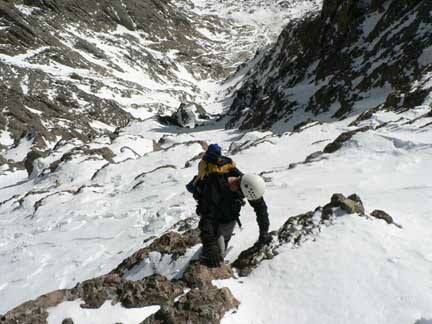 I kicked steps for the group until about 14,150' feet when I ran out of steam and John quietly took over the duty. Close to 2:00pm we exited the couloir left and made our way through small rock bands towards the ridge that would lead to the summit. Bill exiting the couloir just below the summit of Crestone Peak. At 2:20pm, just a little over 2.5 hours after leaving the summit of Crestone Needle, we reached the summit of Crestone Peak. The views of the surrounding high peaks of the Sangres were awesome on this clear, mostly calm winter day! Looking at the Prow of Kit Carson I yearned for another week of good weather to give that route a winter climb--it looked mighty enticing! Challenger Point and Kit Carson seen from the summit of Crestone Peak. We signed in the register and appeared to be the first ones on this summit since October 30th, 2005. John commented how he'd never been on the east summit of Crestone Peak and I tried to convince him we needed to cruise over there but none of us had the juice left and we still had a long hump out back to the trailhead. After a snack and a group photo we began our descent at 2:45pm. Descending the upper section of the peak down to the couloir was a bit tricky with the shallow snow covering the slick rocks underneath but once we reached the couloir it was plunge-stepping heaven for nearly 1,000 feet! The good snow made for quick travel down and when we reached the end of the good snow, we moved out left onto the third class slabs and got down into Cottonwood Lake basin around 3:45pm. We could tell the fun was about to begin though. Willows poking out of snow drifts meant wallowing was about commence. And sure enough it did. We took turns breaking a path through sections of nearly waist deep snow at times between nice rocky outcroppings. However, the wallowing sections weren't as bad or as long as expected and with some decent route-finding we connected back with our tracks from earlier in the day around 4:30pm. We were through the tough stuff and now just had to follow our trail as best we could back down to the packed trail at 10,300'. We ended up a bit off track while staying on the north side of the drainage but managed to find our way back to the good snow trail by 5:15pm. From there it was fast and efficient hiking down and we just barely made it to the vehicles without having to bust out the headlamps arriving back at the cars at 6:45pm. Whew, what a day! Written by Jason Halladay on 26 February 2006 for TheMountainInstitute.com.